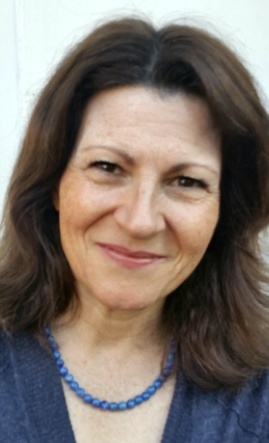 As well as hypnotherapy Debbie also offers, BWRT&REG; (Advanced), Counselling, Life Coaching, NLP, Analytical Hypnotherapy, Generalised Anxiety Disorder Therapy(advanced Training), weight management and Smoking Cessation. A note from Debbie: The above is just a small sample of the numerous conditions and symptoms with which I can help clients to change or resolve. 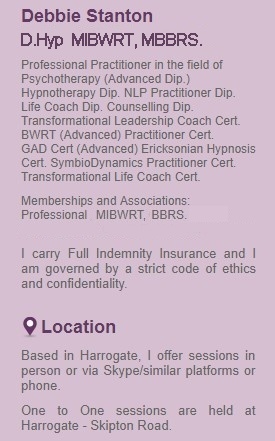 In order to achieve maximum results in as short a time as possible, my preferred approach is to use more than one of the above therapies, enabling my clients to be able to work through their difficulties and move on with their lives sooner. That said, I do understand that some prefer to work with just one methodology or over a longer period of time and within a structured framework and I am happy to work on this basis also if required.